Seven-in-ten Indians are dissatisfied with the way things are going in India today, according to a new Pew Research Center survey. And, with the Indian parliamentary elections just weeks away, the Indian public, by a margin of more than three-to-one, would prefer the Hindu-nationalist opposition Bharatiya Janata Party (BJP) to lead the next Indian government rather than the Indian National Congress (INC), which heads the current left-of-center governing coalition. Dissatisfaction with recent developments in India is remarkably widespread: among both BJP supporters and Congress backers; among young and old; among rich and poor; and among city dwellers and rural residents. But views of the major parties vary across the country, with support for a BJP-led government strongest in the north of India. However, backing for the BJP is roughly equal in both rural and urban areas despite Congress’s deep roots in rural India and its efforts to cement rural political support through employment and food security programs. The 2014 Indian election will select 543 members of the Lok Sabha, the lower house of the national parliament. The new Lok Sabha will elect the prime minister, who will then name a cabinet. India has a winner-take-all electoral system, so whoever gets the most votes in a given constituency wins that seat. No single party has won a parliamentary majority since 1989, so recent governments have involved coalitions of smaller regional parties led by either the BJP or Congress. The Pew Research survey does not directly ask about vote choice or the likelihood that a respondent will vote, and it cannot gauge the level of support for either the BJP or Congress in particular constituencies. But it reveals a widespread desire among Indians for a change in leadership. Just 29% of Indians are satisfied with the way things are going in India today; 70% are dissatisfied. Such disgruntlement cuts across various demographic groups: men (72%) and women (67%); Indians age 18 to 29 (72%) and those 50 years of age and older (69%); those with a primary school education or less (67%) and those with at least some college education (75%); and people living in urban areas (72%) and those in rural areas (68%). 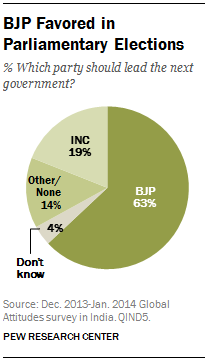 More than six-in-ten Indians (63%) prefer the BJP to lead the next Indian national government. Just two-in-ten (19%) pick the Indian National Congress. Other parties have the support of 12% of the public. BJP backing is consistent across age groups. And support is almost equal between rural (64%) and urban (60%) Indians. Northern Indian states – Uttar Pradesh, Madhya Pradesh, Rajasthan, Haryana, Punjab and Delhi – which together are home to more than 400 million people, give the BJP its highest level of support, with 74% saying they want it to lead the next government. The party’s weakest backing (54%) is in the western states of Maharashtra, Chhattisgarh and Gujarat (Modi is the chief minister leading a BJP-led Gujarati state government). Congress’s strongest regional support (30%) is in the eastern states of Odisha, Bihar, West Bengal and Jharkhand, among India’s poorest areas and home to 270 million people. Support for a BJP-led government after the upcoming election reflects across-the-board sentiment that the BJP would do a better job dealing with a range of challenges facing Indian society. A majority says the BJP (58%) is likely to be more successful than Congress (20%) in creating employment opportunities in the future. BJP prime ministerial candidate Modi leads the economically successful state of Gujarat. 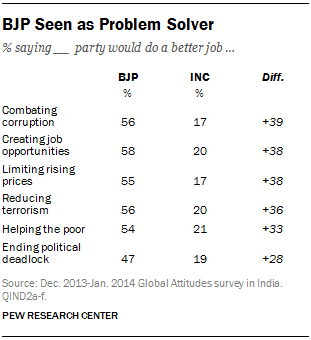 A similar proportion of the Indian public (56%) say BJP would do a better job than Congress (20%) in reducing terrorism. There is equal belief (56%) that the BJP will do more to combat corruption. Only 17% say Congress would do a better job dealing with this issue. Although inflation in January fell to an eight-month low of 5%, limiting rising prices is a special public concern. More than half the public (55%) say the BJP would be better at reining in inflation. Just 17% expect Congress to be more successful in that economic task. In recent months the Lok Sabha has been stymied by partisan disputes. The Indian public says the BJP (47%) is better suited than the Congress party (19%) to end that gridlock. Roughly eight-in-ten Indians (78%) have a favorable view of Narendra Modi, compared with 16% who hold an unfavorable view. Modi’s support is especially high in the North, and he is seen favorably in both rural and urban areas and among high and low income and well educated and less educated Indians. Rahul Gandhi, is seen favorably by 50% of those surveyed and unfavorably by 43%. Gandhi’s favorability is fairly consistent across demographic groups and his regional support is strongest in the eastern part of the country: in the states of Odisha, Bihar, West Bengal and Jharkhand. Sonia Gandhi, long-time president of the Congress party, Rahul’s mother and widow of assassinated prime minister Rajiv Gandhi, is seen favorably by 49% of the public. But 46% have an unfavorable view of her. She too has her greatest support in the east. Roughly half of Indians (52%) have a favorable view of Manmohan Singh, the Congress party’s outgoing two-term prime minister. But 42% have an unfavorable opinion of the man who has served as prime minister for nearly a decade. The public is divided about Singh’s finance minister, P. Chidambaram: 37% have a favorable view, 39% see him unfavorably, 24% voice no opinion. There is only slightly more enthusiasm for Rajnath Singh, the president of the BJP: 43% have a favorable opinion and 34% have an unfavorable view. But again, nearly a quarter (23%) of the public has no view. Anna Hazare, a social activist prominent in the anti-corruption movement that presaged the rise of the Aam Aadmi (Common Man) party that recently took control of Delhi’s state government and is attempting to mount a national campaign for the Lok Sabha, is seen favorably by 69% of the public, making him the second most popular of the national figures tested in the survey.